Robert Beaton (Service No 5334) was born in Newcastle, N.S.W. around 1894. At enlistment, Robert was single, 23 years old, employed as a tea blender, and lived in Wollongong, N.S.W. He embarked from Sydney on HMAT A40 Ceramic with 17th Reinforcements, 4th Battalion, on 14th April 1916. 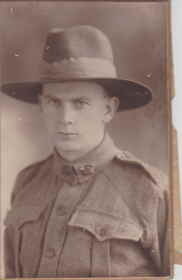 After the troops arrived in Egypt on 17th May 1916 Robert was transferred to 56th Battalion. Robert arrived in France on 29th June 1916 and joined the 56th Battalion in the field on 26th July 1916 - a badly needed reinforcement to the battalion after Fromelles. Robert saw service on the Western Front. until he was returned to Australia in June 1919. He was discharged on 4th September 1919. Robert died in Newcastle in 1975.